A CRNI board member has been sentenced in absentia to four years in prison by Iran’s Islamic Revolutionary Court. According to the detail of the court’s ruling, which is unclear, the cartoonist and activist has two months to appeal the verdict. Kowsar received the news on Sunday afternoon through an Iranian opposition website. The court also sentenced Googoosh, the pop music diva who left Iran in the 1990s and has pursued a career outside her homeland ever since, to sixteen years in prison. This latest development is an echo of the events that first brought Kowsar to the wider world’s attention. He was arrested in February 2000 and spent six days in Tehran’s notorious Evin Prison after mocking a powerful pro-violence Islamist Ayatollah and was charged with undermining national security and insulting said Ayatollah. Later other charges, such as spreading untruthful material causing public unrest and making fun of religious scripture were added. 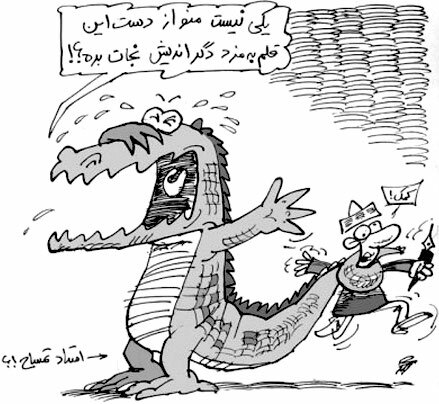 The cartoon that first led to Nik Kowsar’s arrest in 2000. As a result he was the recipient of our Courage in Editorial Cartooning Award in 2001. After leaving Iran he joined the board of our organisation and has worked tirelessly to assist those who find themselves in the same distressing circumstances he and his family faced, or worse.